If you’re moving this spring, you’ve got a lot to think about. 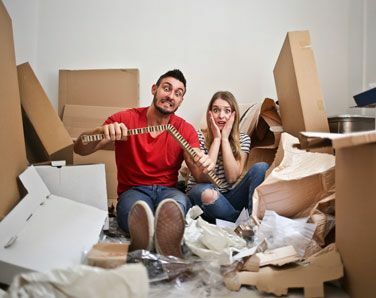 Not only do you need to make sure you pack everything securely and double-check that the movers will arrive on time, but you’ve also got a new home and a new life to start settling into. …Oh, and I hope you didn’t forget you need to clean. As if moving isn’t stressful enough! That’s why you should contact us and leave the cleaning to us. If you haven’t sold your home yet, you need it looking its best to entice potential buyers. Even small details, like smudges on the windows, can distract the buyers from everything else your home has to offer them. The U.S. News’ article “14 Steps to Selling a Home Super Fast” lists cleaning as one of their tips for selling a home quickly. They even recommend hiring a cleaning service for a deep cleaning to get the job done right. If you were renting your old home, leaving it sparkling clean can help you earn your security deposit back. We might even be able to work with your landlord to make sure of this. If you sold your home, you want to make sure the new owners can move into a clean space. We offer the same thorough cleaning services for move-in as we do for move-out. When you move into your new home, you want to feel like the old owners took the same care in cleaning that you did! Unfortunately, they might not have been so thoughtful, and you don’t want to have to spot-clean the walls and dust the blinds before you unpack your boxes. It’s been a long enough moving day already. Let us get there first, and you’ll be able to move in knowing that each surface you and your kids touch is clean and sanitary. No dust, no grime, no germs. Just a blank slate where you can place your lamps and hang your pictures. In each case, professional cleaners can do the sort of thorough work you don’t have time to complete yourself. And you don’t have to stop there! Schedule us on a weekly, bi-weekly, or monthly basis to keep your house looking and feeling as good as new. Book Service Now and let us take care of your move-in and move-out cleaning. Whatever the situation, we’ve got it covered, and we bring all the products and supplies needed to do it. We believe in our work, and we back it up: if your old or new home isn’t as clean as you expected it to be, we’ll clean it again. Your satisfaction is our biggest priority. That, and a floor that doesn’t require a five-second rule. Or view the complete list here.